Updated on 27 February 2019. 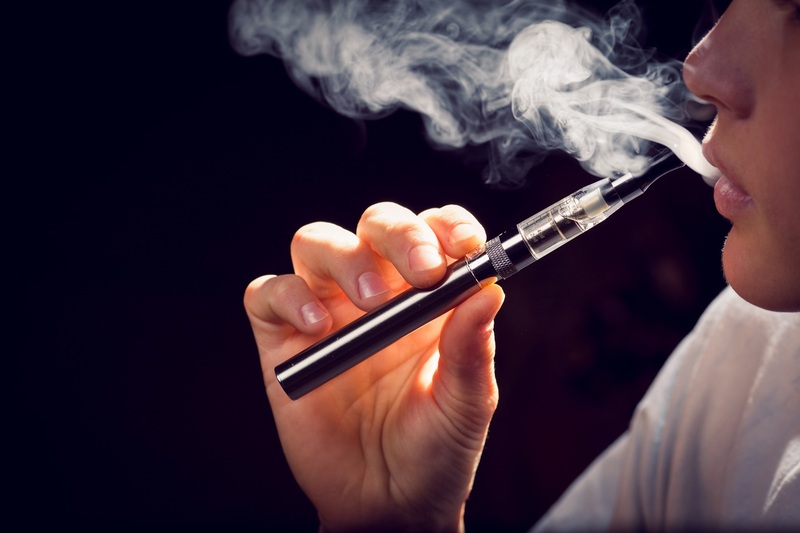 No doubt you will have seen some of the stories in the media recently following the publication of PHE’s latest update of the evidence on e-cigarettes. E-cigarettes do seem to be a bit like Marmite, courting controversy among the public and media alike. Not surprisingly, there are lots of inaccuracies and misconceptions about e-cigarettes and vaping. This blog looks at some of the most common myths and provides the facts. Our latest independent e-cigarette review, authored by leading academics in the tobacco control field, focuses on the up-to-date facts about vaping among adults and young people in England. Despite the sometimes confused, and confusing, media reporting around the safety of e-cigarettes, there is growing consensus around the evidence. While not without some risk, when compared to smoking e-cigarettes are far less harmful. This view is supported by a number of key bodies, including Cancer Research UK, Action on Smoking and Health, the Royal College of Physicians, the British Medical Association and recently, a major US science body, the National Academies of Sciences, Engineering, and Medicine. 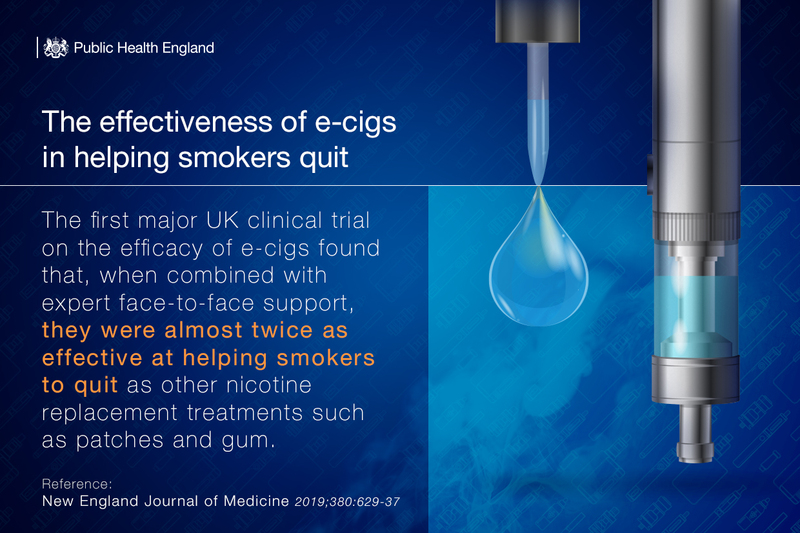 For a fuller picture of the review’s findings please see our blog: E-cigarette evidence update - patterns and use in adults and young people. One of the most commonly held concerns is that e-cigarettes might cause ‘popcorn lung’. This came about because some flavourings used in e-liquids to provide a buttery flavour contain the chemical diacetyl, which at very high levels of exposure has been associated with the serious lung disease bronchiolitis obliterans. The condition gained its popular name because it was initially observed among workers in a popcorn factory. However, diacetyl is banned as an ingredient from e-cigarettes and e-liquids in the UK. It had been detected in some e-liquid flavourings in the past, but at levels hundreds of times lower than in cigarette smoke. Even at these levels, smoking is not a major risk factor for this rare disease. The UK has some of the strictest regulation for e-cigarettes in the world. Under the Tobacco and Related Products Regulations 2016, e-cigarette products are subject to minimum standards of quality and safety, as well as packaging and labelling requirements to provide consumers with the information they need to make informed choices. Four out of 10 smokers and ex-smokers wrongly think nicotine causes most of the tobacco smoking-related cancer, when evidence shows nicotine actually carries minimal risk of harm to health. Although nicotine is the reason people become addicted to smoking, it is the thousands of other chemicals contained in cigarette smoke that causes almost all of the harm. E-cigarette vapour does not contain tar or carbon monoxide, two of the most harmful elements in tobacco smoke. It does contain some chemicals also found in tobacco smoke, but at much lower levels. PHE’s 2018 evidence review found that to date, there have been no identified health risks of passive vaping to the health of bystanders. People with asthma and other respiratory conditions can be sensitive to a range of environmental irritants, as well as pollen and cold air and PHE advises organisations to take this into account and to make adjustments where appropriate, when making their own policies on the use of e-cigarettes..
Our latest report found no evidence so far to support the concern that e-cigarettes are a route into smoking among young people. UK surveys show that young people are experimenting with e-cigarettes, but regular use is rare and confined almost entirely to those who already smoke. Meanwhile, smoking rates among young people in the UK continue to decline. There is also no evidence to support the assertion that vaping is “normalising smoking”. In the years when adult and youth vaping in the UK were increasing, the numbers of young people believing that it was ‘not ok’ to smoke was accelerating. Of course, PHE will continue to monitor the trends in e-cigarette use alongside those in smoking. 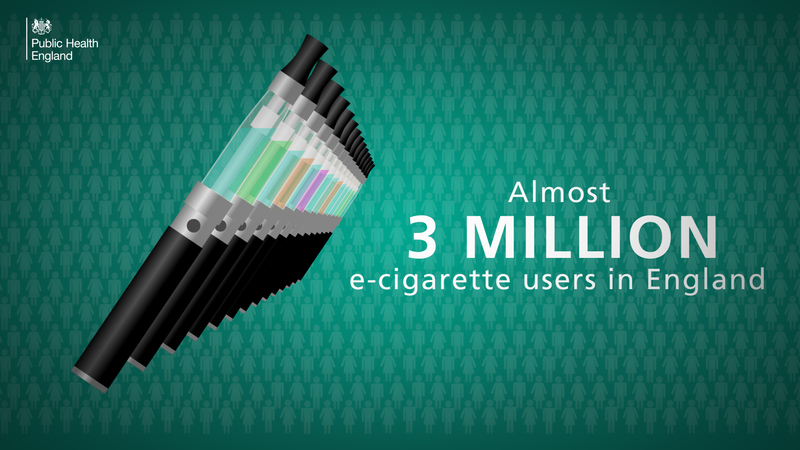 Of the 3.2 million adult e-cigarette users in the UK, more than half have completely stopped smoking. A further 770,000 have given up both smoking and vaping. At the same time, quit success rates have been improving and we’re seeing an accelerated drop in smoking rates, currently at a record low of 14.9%in England. Separate from our review, a major UK NIHR funded clinical trial was published in February 2019. Involving nearly 900 participants, it found that in Local Stop Smoking Services, a standard e-cigarette was twice as effective at helping smokers to quit compared with the quitters’ choice of combination nicotine replacement therapy (NRT). Both groups were provided with behavioural support and those in the e-cigarette group had significantly faster reductions in cough and phlegm. In summary, e-cigarettes and tobacco cigarettes are not the same and shouldn’t be treated as such. It’s important that England’s seven million smokers are aware of the differences and have accurate information to inform their health decisions. 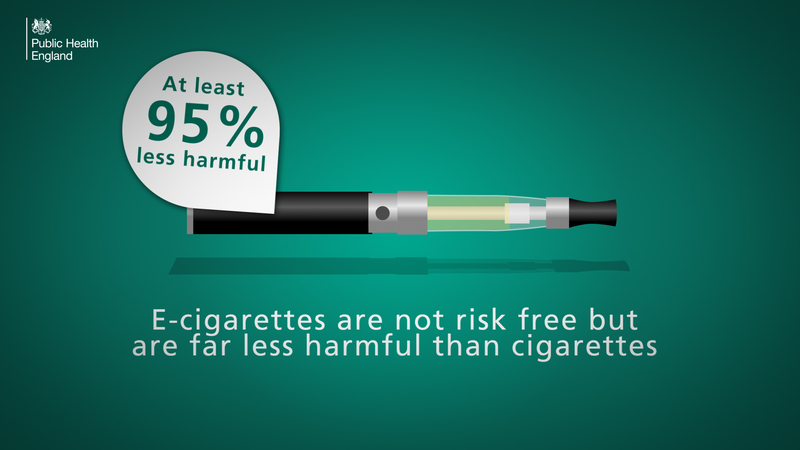 E-cigarettes aren’t completely risk free but carry a fraction of the risk of smoking and are helping thousands of smokers to quit and stay smokefree. You'd gotta be kidding me. If vaping causes fluid buildup in lungs, people would have ruined lungs from taking hot showers. You inhale much more vapor in shower than you can vape in a single day. Stop spreading rumors like this which can prevent smokers to switch to vaping. You might be killing someone by doing so. Anyway good piece of research! after a 38 year bad habit of 20-30 cigs a day i gave up on February 20th 2015 and started vaping and have not touched a cig since. i have just passed 3 years and since then i have saved over £10,000 and not smoked 21,900 cigarettes. its just a shame that we will undoutably still see false misleading fake news reports in the daily fail and mainstream newspapers and sadly people believe everything they read in the papers. once these reports are debuncked with actual facts i think they should be made to retract said reports with a disclaimer. just think how many more might take up this 95% safer option and it may even save their lives. DJ, exactly the same as me! Quit smoking after 10 years of unfiltered roll ups, went on to a decent Ecig box mod (with 6mg juice) and haven't had a cigarette in over 2 years. Couldn't really ask for more from Ecigs than that. You have substituted one bad habit for another. When I quit smoking I could not stop laughing and the substitution for me was a much better life style. You may as well just smoke as use e cigs. It is trading one bad habit for another, but it's a much safer habit. Some people have no empathy at all - if smoking was that easy to quit, why do hundreds of millions around the world still smoke? We can't get all smokers to quit, so an alternative is to provide a safer option that satisfies smokers of their habits. Not really Steve as scientific evidence says they're at least 95% safer. So no you may as well not continue smoking. I do apologise, Dan, as I did not express myself clearly. Of course smoking e cigs is preferable to tobacco. What I was referring to is the impact that smoking (both tobacco and e cigs) have on peoples lifestyles. If you are somewhere where you can't smoke/vape, but you want to, you are under stress. (Strange how a habit that people think relaxes them actually stresses them). People who have a habit that forces them to go outside and stand in the cold have a second class lifestyle, and this is why people should free themselves from vaping. That is what I meant when I said you may as well smoke; you have the same restrictions placed upon your lifestyle and freedom of movement. When I quit smoking (60 to 100 a day) I was over the moon. I had my freedom back. Had I turned to e cigs I would have had exactly the same restricted lifestyle that I had before, and the frustrations that went with it. I recently went to lunch with a friend and she spent more time standing outside the restaurant than she did inside. I have seen people sitting outside coffee shops shivering in the cold because their coffee and smoking habit is so strong. In my neighbourhood vaping isn't allowed anywhere (that I frequent), so people have to leave the company they are in and go outside to vape. I would not wish to live like this. Smoking anything just imprisons people and forces them to live life on the outside. As for the scientific evidence, it depends which experts you listen to and believe. At least with e cigs you are not inhaling tar. Nicotine is a deadly poison but you only inhale tiny amounts and it is quickly expelled from the body. One thing I can say is that many people feel sick when they inhale the fumes from e cigs, including myself, and as no-one knows what chemicals they are inhaling (and that is an absolute fact that can't be argued with) no one can say what the long term impact on an e cig users health will be. Given that e cigs haven't been around for that long I would say that any scientist pronouncing them safe is perhaps being a tad rash and hasty. I quit smoking in 2002 and have never had so much as a craving to put a cigarette between my lips. To quit a smoking habit only to find yourself with an e cig habit isn't the best option as it will continue to curtail your freedom. Every time I see someone smoking I think "thank God I don't do that anymore." That is real freedom. Actually i can’t speak for everyone but vaping a lower dose nicotine strength until i got to 0 helped me quit. I have been nicotine and cigarette free for 3 years after smoking 20 years but still love to vape. The hand to mouth habit is just that. A habit. Not a bad habit. No cigarettes, no nicotine, just fun tasty flavors. I was smoking 40 cigarettes a day but started using vapes 1st October 2017 and not had even one cigarette since( there have been days when i really really wanted a smoke but have not had one) breathing is getting better according to the surgery nurse after a test so I am staying with the vapes. There are 3 main ways people try to quit smoking: DENIAL. With denial people say I don't smoke and they stick with that, no matter how bad they feel. You need will power! People who are in denial are the people who flap their hands around smokers. When they see someone smoking they become defensive and flap their hands, because the smoker is doing what they want to do i.e. smoking and they want the person to go away in case they succumb. SUBSTITUTION: People quit one bad habit, smoking, for another. This includes all forms of NRT including e cigs. People may drink alcohol or eat chocolate, anything to make themselves feel good and to get some reward for the loss of their perceived smoking pleasure. It is a complete fallacy that people put on weight because they stop smoking. They put on weight because of the stuff that they swallow to compensate for the loss of their perceived smoking pleasure. AVOIDANCE: People decide to avoid all the places they used to smoke and all their smoking friends. This results in a huge change of lifestyle, this causes immense stress and what do all smokers turn to in times of stress? A cigarette! That is what I would call a viscous cycle. If you want to quit smoking just have a look at your lifestyle and compare it to a non-smokers lifestyle. There is no comparison. i gave up a 30 a day smoking habit in Jan '16, and haven't smoked a cigarette since.I started using e cigarettes 2 weeks before i quit, and after trying everything available on the market to help me quit smoking, i have to say that, vaping with E cigarettes ,is definitely the way to quit for good! I have saved so much money in the past 2 years,and my health is so much better! I would recommend vaping e cigs if you really want to quit smoking! 17th September 2016, the day I got my first e cig set up - I haven’t touched a stinkie since! I have asthma and within 3 months of quitting tobacco I could also stop using my preventer and rarely use my inhaler. I've used ecigs since 12th of December 2015, had been smoking 20-40 roll ups a day and my body just couldn't cope so I moved onto ecigarettes. During this entire time of ecigarette use, my breathing improved and I never developed any symptoms except from irritable eyes from the vapour itself. More needs to be done to prove that ecigs work as an alternative to smoking to the public. E-cigarettes should be seen for what they are: a means of continuing nicotine addiction in a way that it is hoped will be safer than smoking. But even if e-cigarettes turn out to be 100% safe, why should former smokers have to subject themselves to inhaling nicotine-laden fumes repeatedly throughout the day, every day, for years on end? If e-cigarettes are ‘contributing to at least 20,000 successful new quits per year’, and if this rate of attrition continues, for all of England’s seven million smokers to quit it will only take 350 years! Nicotine addiction isn’t a problem though. Thousands dying from smoking is. We don’t sit and fret that people drink coffee and have a possible addiction to caffeine. The only reason people are addicted to nicotine – whether through smoking or e-cigarettes – is because of their perceived inability to quit. Users of e-cigarettes take dozens or hundreds of puffs every day and it is therefore a false analogy to compare it with drinking coffee. Sucking nicotine and other chemicals into your lungs repeatedly for years on end is unlikely to do you any good. You sound a bit preachy and judgemental. Nicotine is very addictive, do you think most smokers wouldn't like to have a cigarette then leave it? I took up smoking because of stress and then oops! I became addicted, just like that. Tobacco smoke is harmful, vaping 'fumes' (???) are not. I use cbd now, i have arthritis and fibromyalgia, bypassed the whole nicotine vape thing, so....going to preach about that now? Yvonne: If you ask a manufacturer of e cigs what is in their "flavour" you will get nowhere. They have no idea what chemicals are in the flavour, nor the safety of them. These chemicals may be tested individually but not jointly. Millions of people around the world are made ill by commonly used chemicals - for instance Air Freshener - and these are the same chemicals that go in to e cigs flavour. I do not want to inhale this, and I do not want the users of e cigs to puff these chemicals all over me. Also, smoking is largely habit , not addiction to nicotine. NRT doesn't work because the hand to mouth action of smoking is missing. If all people needed was nicotine NRT would work, but it doesn't. E cigs provide that action and people become addicted to them. You read about people quitting smoking using e cigs, but then smoking e cigs for 3 years! It is substituting one bad habit for another. People who smoke are socially ill at ease. Why can't people have the confidence to go out for a drink or have a meal in a restaurant without the need to puff on a cigarette or e cig? It seems to me that Government wants to make the smoking of e cigs acceptable in public places like bars and restaurants. I cannot stand the stench of e cigs and don't think anyone should be allowed to inflict the smell upon me. Smoking is not habit, it is addiction. It is one of the most addictive substances in the universe. If you are banning ecigs people will go back to cigs. If you are banning cigs, people don't have to go back to ecigs. Ban cigs! Ecig might have harmful chemicals? Cigs DEFINITELY have harmful chemicals! Number of deaths from smoking ecigs vs number of death from death from smoking cigs has to be taken into picture. People who have never gone for cigarettes but take ecigs would have tried cigarettes at some point if ecigs were not available. What stench of ecigs? You find the mild aroma of strawberries or cherry etc offensive?? People don't whinge about people drinking, or having coffee, or even cooking....the smells from those are more potent than the barely there smell of "vape". I think anything that can get people OFF tobacco products and into better health, saving YOUR national insurance contributions should be praised and encouraged, not derided and complained about. You should save this attitude for drinkers and people with a poor diet!! Steve, get a grip. Agreed,people shouldnt blow e-cig smoke all over you. I dont think anybody, smoker, e-cig smoker, or non smoker would say that is ok. But you are just plainly wrong to be so damn judgemental, if vaping is 95% safer and helping people to stop a habit that is clearly going to cause them to die, then why have you got an issue with us using vaping to try quit instad of continuing with the horrible habit? Im 2 weeks into vaping myself and feel a hell of a lot better and havent even thought about touching a ciggaraette, and im happy about that. What gives you the right to say something so judgemental when you have no idea how hard it is to try quit? Why do you even care, your clearly not a smoker, so you clearly dont have a clue wht your talking about. Steve- Said like a true ex-smoker who probably puffed smoke all over people for years. Why are you so interested in e cigs if you don't even use them? Maybe you should just enjoy being smoke and nicotine free and leave everyone else to their own devises ( literally haha). I could stop vaping but I don't want to...I enjoy it just like you enjoy spending your time spreading your doom and gloom! Steve I applaud you for your strength.what about the rights of non smokers and those who don't vape? It seems too many debates around this subject ignore our needs for fresh air. The world health organisation reviewed studies which highlight the harmful toxins in the aerosol of e cigs. And what about the packaging? It's all harmful to our environment. I applaude anyone who can take up a n alternative and stop supporting financially this unhealthy lifestyle. Sorry if that sounds preachy but there are millions of non smokers who se rights have been overlooked for decades. My mother had smoke fumes inflicted on her most of her working life and her father too, who died of lung cancer. Some people smoke as they have mental health problems,I can only tell you about my experience,I have Asperger's, which I did not know until the age of 43, when I started smoking at the age of 15,it really did seem to help me to relax and de-stress,as you get older you start to realise that it comes at a cost to your health,I was always a considerat smoker, and did not smoke around non smokers.when I chose to start vaping,I did it with the intention of reducing the amount of nicotine every couple of months,to wean myself of nicotine, and it really does work,as for breathing in other people's fumes,we are all at a higher risk of illness,by walking along the pavement and breathing in all those lovely exhaust fumes,do we ban all cars, lorry's,busses and of course the biggest polluter the cruise ships,so in the grand scheme of things,I think that vaping is acceptable.but people who vape should still be considerate to other people. What about the rights of non vapors, are you gonna vape around us? It seems that people who don't smoke or vape have no rights. Every time I walk through hospital grounds I m passing people with cigarettes and am forced to breath in this disgusting filth. rights go both ways. Guess what, your rights aren't being ignored, which is why smoking is banned inside in a lot of places. they have just as much right to stand outside as you do, and no one is forcing you to walk right past them. walk around if it bothers you so much. As for the aerosol, I was able to find a single claim that exhaled aerosols contained toxicity on any level, and when I looked at their source, it stated that "little to no research has been done on this" and basically their source was someone just playing with numbers based on guessed. I think everyone assumes everyone who vapes uses juice with nicotine in it. Most people who do it right will reduce the level of nicotine until it is at 0. And the habit of hand to mouth vaping with no nicotine is someones habit. Not a bad habit just a habit. No nicotine for three years here. Had smoked for 20 years. Love vaping 0 nicotine flavors. Feel great not smelling like a cigarette. Well you could say that but vaping allows you to ween off nicotine by reducing the amount in the liquid you use. When cutting down smoking it’s harder to do for one and second you are still inhaling tar and other cancerous chemicals. Vaping isn’t a healthy option but it helped me quit smoking. I vaped and reduced the nicotine to 0 in under a year. As soon as this last liquid is finished I won’t be buying another. I am a 75 year old and started vaping at 70 years old not had a tobacco product since. It works for me too viva vaping. I started smoking at at a pretty young age and continued well into my 30's. Within a week of buying my first decent mod and tank i had practically kicked a 15 year habit. I found that i was addicted to the sensation of smoking more than nicotine or other substances. The fact that vaping is now recognised as being significantly safer than smoking by official medical channels is truly refreshing and i hope it helps lead more people away from such a harmful habit. You hit it on the head in your blog. Most smokers smoke out of habit. Something to do with their hands. Helps ease boredom. Of course nicotine is like cannabis and addictive. Agreed Grinner, incorrect beliefs held due to misinformation, ignorant press and successive governments ludicrous statements in regard to a matter they know nothing about, simply because they buy the ignorant catch all phrase "drugs bad". Alcohol is many hundreds of times more addictive than cannabis, it is also hundreds of times more harmful, not only to the drinker, but to families and society as a whole. But because booze can be taxed, booze is good ! Whilst cannabis cannot be controlled (it grows in the wild if allowed to) and the drug companies won't do the research into it's benefits, cancer and M.S. treatment, only because they can't then patent and own the product as it grows freely in nature, it will remain on the "drugs bad" list as it isn't profitable to "big pharm'" or governments. Excellent comments on the myths, agreed totally. But at the same time have the pleasure to correct the beautiful green graph stating UK has the second lowest smoking prevalence in Europe with 15.8%. Well, that would be correct if it had said in EU, not Europe. Iceland (still in Europe) the smoking prevalence is already down to 9% and youth smoking prevalence down to 2% which are both the lowest in Europe or any other western country. Stopped smoking cigs 3 years ago, and started vaping. I feel better, look better, smell better, and I'm back to hiking, mountain biking, camping, etc... I have my girlfriend to thank for it, she wants me to live. Currently working on phasing out the vaping, hope to be completely free of all of it within the year. I smoked for over 40 years, I tried numerous times to give up over the years and the most I ever managed was 3 months until I started vaping. I haven’t had a cigarette since 3rd January 2017. I still vape but could stop at anytime as I no longer have nicotine. My husband gave up at the same time and he didn’t even want to. Three and half years into vaping after 30 years of smoking and the health benefits were apparent just weeks in. The issue of quitting Vapes and a dependence on them is a real one but as yet, it has not become critical. To date, and unless contradictory research emerges, it was a positive move for me personally. June 2015 I stopped smoking after 22 years of a 30-40 a day habit. This couldn't have happened without my vape. After a few months at the highest nicotine I stepped down then a few months on that and so forth until middle of last year when I went to 0 nicotine! A few months of struggling and nearly cracking then January this year I'm completely vape free. If I'd have listened to all the doom and gloom I'd still be smoking now, stinking, unable to breathe, unhealthy and a lot poorer for it all!!! I smoked 40-60 smokes a day for over 30 years and had tried everything to quit but always failed and went back to smoking. Just over 5 years ago I discovered vaping and since then I have bot smoked since, for the last 18 months I now do not even use nicotine. My health has improved I have lost weight as I know walk a lot without being out of breath, vaping has saved my life. Being from the Netherlands born in May 1947 and a frequent visitor of the UK I came in to contact with e-cigarettes in whilst in England,I bought a mod and tried several times but layed it aside as not something for me,I only used it on the ferry whilst crossing to the UK. Good for you. There is an added bonus of course. You will not smell like a dirty ashtray when you are near people. So well done. I was in exactly the same position as you. I had smoked for 45 years, and tried vaping before from cigs bought from a supermarket, hence they did not help at all, as I wanted my vaping to taste like cigarettes not strawberries. I eventually went to a proper vape shop, found the right mod for me and the right e-liquid (yes it tastes of cigarettes). I have not had a singe cigarette since starting vaping, and have not felt the need for one either. I feel better, smell better and am much better off financially. I strongly advise long term smokers to try this as it DOES work. Do you think you should be able to smoke these around non-smokers? For instance, if you are in a restaurant? Nothing that I didn't already know but a good article. Smoked 30 to 40 roll ups for over 40 years, I knew it was killing me but just couldn't give up. Got my first e-cig in June 2010 and within a week I stopped smoking and have not smoked since. The restrictions they are trying to put on vaping is to be blunt, just down right criminal! As twisted would say "vaping saves lives"
Philip: The smell of e cigs is just as horrid as tobacco. Please don't smoke them in public. Thank goodness for an accurate account of vaping versus cigarettes . I get tired of reading " fake news " about vaping . I have vaped for 3 years now and my horrendous smokers cough was conpletly gone within 4 months .That alone told me it was far better than cigarettes . I quit cigarettes a year and 6 days ago on my birthday. I said I would quit when our baby was born but didn't. So about 6 months after his birth my partner bought me a vape for my birthday. I had my last roll up that day and haven't even considered a cigarette since. I used to smoke 20-30 cigs even more at the weekends for the past 38 years,i was advised by doctors as you do to give up smoking,so i tried various alternatives,gum spray and champix,now champix was said that one of its side affects is may cause suicidal tendancies which obviously didnt affect me otherwise i wouldnt be here writing this .i managed to stay ciggy free for 10 days then back on them,then as of march last year i took up vaping got myself a decent setup so that i could get a satisfactory hit and away you go i have found it so easy to give up smoking using the vaping alternative but the best thing about vaping is it is more sociable people will stop and ask you questions about your device or what juice you on.you never see a smoker go up to another person and say hey man what fags you on.erm woodbines 18 mg.cmon folks smoking is dead ,vape on and live longer. I started to smoke at the age of 13, because back in the day it was cool to smoke. Kept smoking till I was 43, and I was then smoking an average of 20 a day. Like most vapers, I started with a simple vape pen with what I now consider an awful 1.8mg liquid. I kept vaping, initially out of stubbornness, but after 2 weeks I started to notice very small differences. I didn't wake up coughing anymore, and was able to go upstairs without having to stop in the middle to catch my breath. I thought to myself "Can it be?..." I decided to invest in a better kit and was lucky enough to find a shop where they knew what they were talking about. I was recommended a better equipment but also taught about the quality of the liquids and that it would be beneficial to use a lower strenght liquid with this new kit. Which I did. Two more weeks and all of a sudden I rediscovered food. Everything became so more tasteful! As an added bonus, I was even able to reduce the amount of salt I was putting in my food, which helped with my blood pressure! And my lady, for the first time in ages, told me : " You smell nice today!..." No more nasty ashtray smell at home or in my clothes, or in my car, no more disgusting ashtrays full of cigarette butts, even my dog is happier because all of a sudden I enjoy taking him out again! Risks? Yes, there are some. But the rewards are worth it. And I am not saying vaping is a good thing, or that you should feel encouraged to start vaping just from what I said. I'm just sharing my personal experience, which I hope will help shed some light on so many lies and false propaganda about vaping. Oh, final note, I am now down to 0.3mg nicotine, after 2 years. In autumn 2012 I had my first contact with ecigs. I never had the aim to stop smoking, because I like it. But I was interested in that amazing new technology. So I read a lot in the internet and bought my first ecig. After four weeks I stopped smoking automatically! Now I'am over 5 years smoke free thanks ecigs => without pressure but with pleasure! After 32 years of smoking, I started vaping at the start of June 2016 and haven't touched a cigarette since. I didn't suffer any cravings either, which was completely different to my previous attempts to quit using various other methods. What alerted me to vaping was a BBC Horizon documentary by Michael Moseley ('E-Cigarettes, Miracle or Menace), which seemed to me, as a smoker at the time, to be refreshingly non-judgemental. I therefore did some research and decided to investigate further. What really made an impression on me was when I realised that I could have a beer without craving a cigarette, at which point I realised there was no point continuing to smoke when vaping solved that problem. However, getting people to even consider e-cigarettes is difficult. I know plenty of people who won't even consider it, despite knowing that I used to smoke as much as they still do and also knowing that I have stopped smoking despite having had difficulties in the past. Therefore the more accurate information that is out there, the better. Second hand effects are real.. I get migraines from breathing in vape clouds. It’s worse in confined spaces but even outside, if someone walks past me vaping I get a headache that progresses into a migraine. Ecigs give me headaches. It’s very stressful for me and makes me feel very ill and can impact on my life for several days. That's not real. That's anecdotal. You're breathing in water vapour. Nothing more. It’s very real, and upsetting. I’m pleased that there are alternatives for people who smoke tobacco and want to give up but I think they should do some studies for people like me. I get that I may be in a small percentage group that are very sensitive. Thank fully I can avoid the vapour most days however when I can’t the migraine lasts a long time, making me feel sick and taking me out of normal activities like looking after my family and work. I have been seeking out studies that I can contribute to and that is how I came upon this discussion. That’s how real it is. Yes I agree with you, I get really wheezy when a vaper is anywhere near and I cannot avoid them. It definitely is REAL. As to Dazzadooby's comment saying it is only water vapour, then why not stand near a kettle boiling or stand under a hot shower and then you will get the water vapour you obviously crave! Even senior pulmonogists agree that it is not only water vapour, it has PG, VG, glycerol, flavourings, and more often as not, nicotine, most of us do not want that stuff wafted into our faces. Sorry Laura replying with a rant about another poster but think very relevant! Also, no matter how 'anecdotal' you think a comment is, you are being entirely arrogant and, evidentially, mis-informed. Hi Laura, I also am affected by the secondhand vape fumes. When I stay with a relative who vapes I get a bad chest. It took me a while to realise this. The fumes from e cigs make me feel ill. Of course the fumes don't come from water vapour! I asked an e cig company (Blue) to tell me what is in their "flavour" and they couldn't. It is like having air-freshener blown all over you. It is horrid and detrimental to health. No one should have to tolerate e cigs. Every week this blog just gets better! Thanks for being a great resource, just added some of these resources to our own site. I smoked roll ups for 40 years and eventually ended up in hospital with chest pain, I was told stop cigarettes and eat healthier. I started using a decent vape set up and now only a month later I don't even want a cigarette and I will not go back to cigarettes. I was lowering the nicotine level weekly but last time the wife got my juice she got zero nicotine by mistake. I used it in my vape unknowingly it was nicotine free for 4 days and not once did I feel any different, proved my addiction is habit of using my hands. I tried patches gum hypnotherapy all sorts and failed but vaping worked to stop me smoking cigarettes. Next step is to quit the vape for me. My message to any cigarette smoker is try vaping if you want to stop cigarettes it really does work. I feel loads better no more chest pain or coughing or waking with a throat full of phlegm. I have been vaping for seven years now. Prior to this I smoked for thirty years. My health is so much better, greater lung capacity, more energy, no nasty cough in the morning. I cannot, for the life of me, understand why some places are banning it. As far as I can see there is no evidence to support “ passive vaping “theories. There is however, plenty of evidence to support the fact that many thousands of smokers have given up due to vaping. I reckon that sending e cig users outside with the smokers is far more likely to encourage them to start smoking again. I get adverse reactions to some strong perfumes and aftershaves but I wouldn’t expect someone to leave the premises because their perfume was making me sneeze or giving me a headache. After smoking for over 50 years, I have been cigarette free for the last 4 years. All down to ecigs. I weaned my way down to 0mg of nicotine for the last year. But for the last 3 weeks I havent even had a puff of my ecig. Ecigs really do help you quit the ciggies. Long time ago I tried to make a correction here in the comments to your claim (last video) that UKs 15.8% smoking prevalence was the second lowest in Europe. Thats wrong but if you change this to EU then you would be correct. Hope you correct your claim, you are still wrong on this, and the "problem" does not disappear though you delete my comment the second time, or, maybe third time will do? If I remember right UK position on smoking prevalence in Europe is 5th place, so include the other European countries that have far lower smoking prevalence or just change Europe to EU. Simpler. Thank you for flagging this and apologies - this will be corrected to EU in future materials. Who writes this nonsense on behalf of the government? No one should be subjected to any form of passive smoking or plumes of noxious "vapour", especially when they are in a pub or restaurant. If it helps people to stop smoking, all well and good, but unfortunately people take advantage of "Official Reports" like this one to inflict their habit and obnoxious fumes on the rest of us. I like a drink in a pub now and again, and I think that I might have to find a local Wetherspoons outlet, where "vaping", like smoking, is not allowed inside. I call these "vapers" Apaches, because many years ago cowboy films always had at least one scene showing the Apache Indians sending smoke signals. Today, they wouldn't even have to gather firewood! I am all for people, who have become addicted to smoking, to give it up via e-cigarettes, but not at the expense of people who have chosen not to become addicted. We, the careful unaddicted, do NOT want to share your e-cigarette vapour! We do not have to prove anything to demand that our air space be kept pure. Clouding the air in public spaces is just plain inconsiderate and, for that reason alone, should not be supported by anti-smoking organizations. "Myth 4" states " there have been no identified health risks of passive vaping to bystanders" and "People with asthma and other respiratory conditions can be sensitive to a range of environmental irritants, which could include e-cigarette vapour. " Contradictory? And how is this to be assessed - by requiring everyone in a workplace to fill in a questionnaire as to whether they have a respiratory condition? And how would this be assessed in pubs and restaurants? I am really struggling with my partner vaping indoors. I am really pleased that he isn't smoking anymore but now he vapes pretty much constantly and over the last few months it has become a real problem as it irritates my lungs and I can't stop coughing and get a horrible headache when he is vaping in the same room. I have always struggled with bronchitis and mild asthma but because there is little scientific evidence he is adamant that I am making it up. We don't live together so he just goes home if my coughing gets too bad as he won't vape outside. I used to work in public health and I agree that vaping is better than smoking but I don't think we understand the potential health risks and respiratory irritants yet. It may only be a small number of us who are affected by passive vaping but there needs to be more research. After 16 years of smoking, I couldn't be happier that I found an alternative like the electronic cigarettes. Now I am vaping for 4 years, and I also reduce the daily consumption of my e-liquids and nicotine. I feel remarkably better in my daily life (actually I felt better after the first 3 months) but now after 4 years my lifestyle change entirely for the better. I am more active, I exercise a lot, my body and shape are like when I was 18 years old (I am 36 btw), the most important is that I can be with my kids spend more time with them without putting them into the position of being SHS (secondhand smokers). For me, everything started when my friends at ParagonJuice.com introduce me to the e-cigs, and with their guidance, I manage to stop smoking and start vaping, by having the help and listening to the pieces of advice of experienced vapers. This helped me to save money, time and effort and I entered the vaping community with a piece of mind, so once again thank you, buddies. I'm a Public Health intelligence manager for a Local Authority. I think there should be a campaign in high smoking prevalence areas to put these myths on billboards. I'm based in South Essex where it's relatively high, and I think it could have a major effect. I also say this as an ex-smoker who moved to vaping to help quit, and whilst cost, health and even the actual experience of vaping are better than tobacco smoking, myths like these are I think inhibiting people from transitioning. They used to smoke quite a lot and the smell would seep into my flat now they vape....and they vape all the time...non-stop vaping. At least with tobacco there was limit to what any human could consume without passing out or vomiting. With vaping there is a general belief that it is almost "Good for one's health" and therefore no restraint is necessary. I find the small of the vapour pretty foul and when it seeps into my flat it is like the smell of some cheap cleaning product or air 'freshener', except the air isn't fresh it is stale. It doesn't feel good for my health, I have become very sensitive to these fumes and have started to feel unwell. Surely vaping on such a grand scale cannot be good for their health or for mine? I’ve been vaping for 6 years, and have never felt better. All the people who smoked outside, now vape inside at the bingo, what are we all coughing and choking. The stench of e cigs is disgusting. It makes me really ill. They shouldn;t be allowed in public. The stench of burning animal flesh makes me ill, it shouldn't be allowed in public. The noise of whinging people makes me ill, they should stay home. Thanks a lot for sharing the article with us. I found a perfect article about e-cigarettes & vaping. The article is really very helpful for us. Vaping just about killed me, sore lungs, no energy, near death. Could people who vape say if they consider it to be acceptable in public places like bars and restaurants, and on public transport, and why so? People are dirty, full of germs they breath near me when they know they are ill, why do they do this? why do they not wear at least a face mask when they are sick spreading their germs around its disgusting. people shouldn't be allowed to drink coffee in public because caffeine is a harmful drug and it sends the wrong message to children. I'd recommend reading the world health. Organisation s review on vaping.